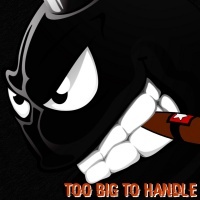 Newcomers BALLS OUT, from France, have released their debut "Too Big to Handle" via M & O Music. Having been founded in 2016 there isn't a whole lot of history or details to be found about these guys. Given the name of the band and what I've gathered, they are a party band. BALLS OUT’s sound that is an accumulation of all sorts of influences collectively colliding to create one distinct brand of rock music. Go ahead and top them off with a little humor and a side of attitude. “Time to get your balls out” is a fitting name for the intro of "Too Big to Handle." The 36-second track gives a great summary of the plot of the album. You know exactly what you are getting into. The majority of the tracks don’t clock over 3 minutes. Very simple and easily digestible song structure. “Wet and Late” gets a punk like drum introduction that welcomes a scaling guitar riff followed up by the bass adding the beef. There are occasional halts in the music to emphasize the vocals which are always an opportunity at live shows for the crowd to yell in unison. The bridge of the song has a saturated flanged bass line and rather do a build up every instrument gradually falls back in line and the song is back on a roll. The ending track, “Balls Out”, welcomes the back and forth of I sing and then you sing it back chorus line which makes the track easily memorable. In what other instances would you ever be coerced to yell about getting your balls out? The songs main riff is almost identical to “Cat Scratch Fever.” That hint of familiarity also contributes to the tracks ability to corrupt and take over in your head. While it isn’t a song you’d want to be singing to yourself as you walk through the halls at work, I guarantee at some point you will find yourself singing it. Overall “Too much to handle” is a great introduction to the band BALLS OUT. They did a great job of keeping it short and sweet. Like an appetizer, you may find yourself wanting more. The semi-humorous band name and song titles demonstrate not only a great play on words but also gives you some insight as to what to expect from these guys. The lack of easy to find information also sparks the curiosity. BALLS OUT is well rehearsed and you can't tell that this is a debut album or that this is a band in its infancy. The audio production is clean, clear and well mixed. None of the songs are too far away from each other but they aren't redundant either. They have an established sound that leaves you wanting more and a definite interest in their live show. The overall attitude and feel are that it would be a humorous, interactive and energetic experience.